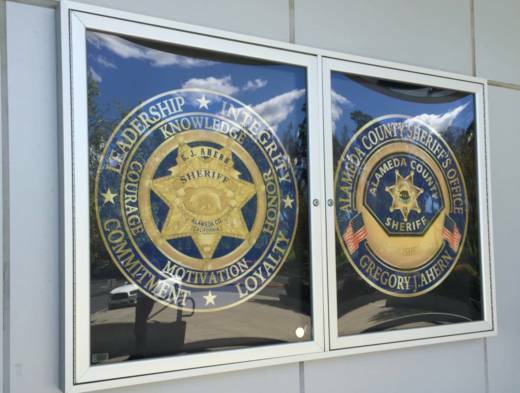 Alameda County prosecutors have filed four felony charges against a sheriff's deputy for illegally tape-recording conversations that four juvenile suspects had with their lawyer earlier this year. Sgt. James Russell allegedly recorded the privileged communication involving the four robbery suspects and a deputy public defender at the Eden Township Substation in San Leandro on March 15. After the allegations came to light in August, Russell, a 20-year veteran of the department, was reassigned to an administrative desk job, according to Sgt. Ray Kelly, a spokesman for the Alameda County Sheriff's Department. In the last week he was placed on paid administrative leave, Kelly said. "This breach of trust, this breach of attorney-client privilege, is significant," Kelly said. Alameda County Public Defender Brendon Woods said that punishment was not severe enough. "You would think that someone in law enforcement who's got pending felony charges should no longer be in law enforcement," Woods said. "What they did was illegally record privileged communication between our juvenile client, [and] our attorney, and that's clearly illegal. And they should know better," he said. District Attorney Nancy O'Malley announced Wednesday that her office had filed four counts against Russell of eavesdropping on or recording of confidential communications. "Every one of us working in the justice system must be held to the highest of standards when it comes to protecting an individual's constitutional rights, including the sacrosanct right to privileged communication between a client and his or her attorney," O'Malley said in a statement. If Russell is convicted on all four counts, he could face up to five years in prison, according to the district attorney's office. Prosecutors say recordings from Russell's own body-worn camera show him arranging for the deputy public defender to talk to the four juvenile suspects and place one of them in an interview room. On the video, Russell is seen and heard telling a sheriff's lieutenant that the lawyer would be talking to one of the suspects, according to a declaration of probable cause written by district attorney inspector Blair Alexander. "The Lieutenant then asks Russell if he records the meeting. Russell replies that he does record such confidential meetings," Alexander wrote. The sheriff's office also handed prosecutors two DVDs related to the case that showed recordings of "confidential attorney/client communications between a DPD (deputy public defender) and all four juveniles," the declaration states. The district attorney's office eventually dismissed the robbery case involving the four juvenile suspects. Meanwhile, prosecutors say they are reviewing all juvenile cases that have been submitted by the Sheriff's Department between the beginning of the year and August. "We have no idea how widespread this is," said Woods, the public defender. Since word of the videotaping allegations against Russell were revealed, the Sheriff's Department has had its employees review policies regarding attorney-client privilege, according to Kelly. "This definitely has impacted morale," Kelly said. "It's also let law enforcement officers here and around the region know that we are held accountable for what we do and that we are no different than anyone else," he said. Kelly said he believed Russell was represented by a lawyer with the Sacramento-based Mastagni Holstedt law firm. A representative for the firm did not return a request for comment. Russell is expected to be arraigned Oct. 17.